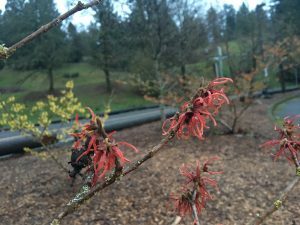 Fire Charm is a reliable and profuse witch hazel with red/orange blooms. Originally bred in Germany and sold as ‘Feuerzauber,’ it is a hybrid of Hamamelis mollis and Hamamelis japonica. Fire Charm is just one of over 70 cultivars of witch hazel at Hoyt Arboretum. Find it in the northwest corner of the Vietnam Veterans Memorial parking lot. Find it in the plant database. 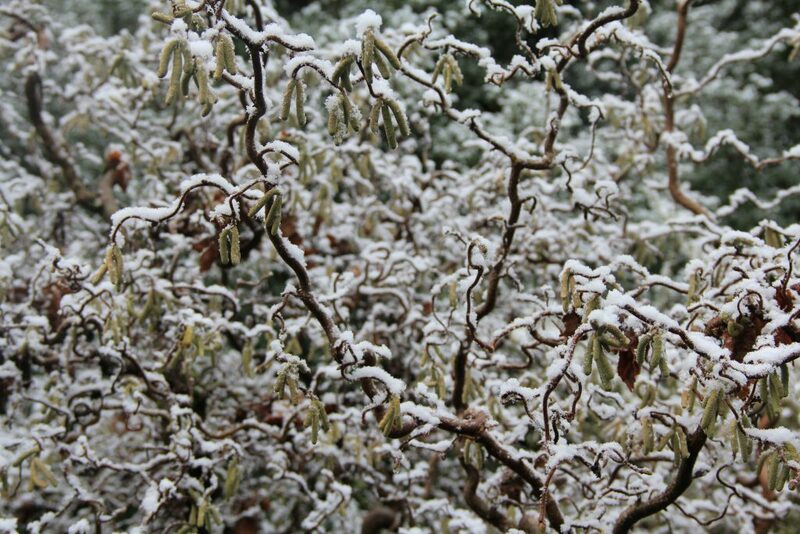 Once the Corkscrew Hazel’s leaves have dropped you can see where its name comes from. A marvelous puzzle of twisted branches gives this tree a unique sculptural quality. Find it in the Winter Garden. 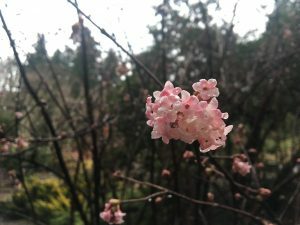 Viburnums are known for their fragrant flowers; the ‘Dawn’ is no exception. 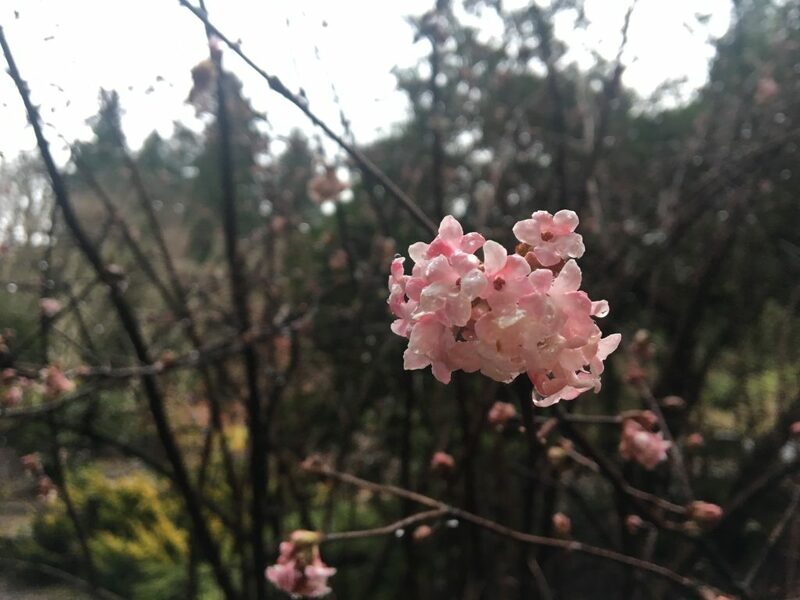 With its bright buds opening to small pink flowers that fade to white, this shrub can be a magnificent sight. Look for red fruit following the bloom. Find it in the Winter Garden. 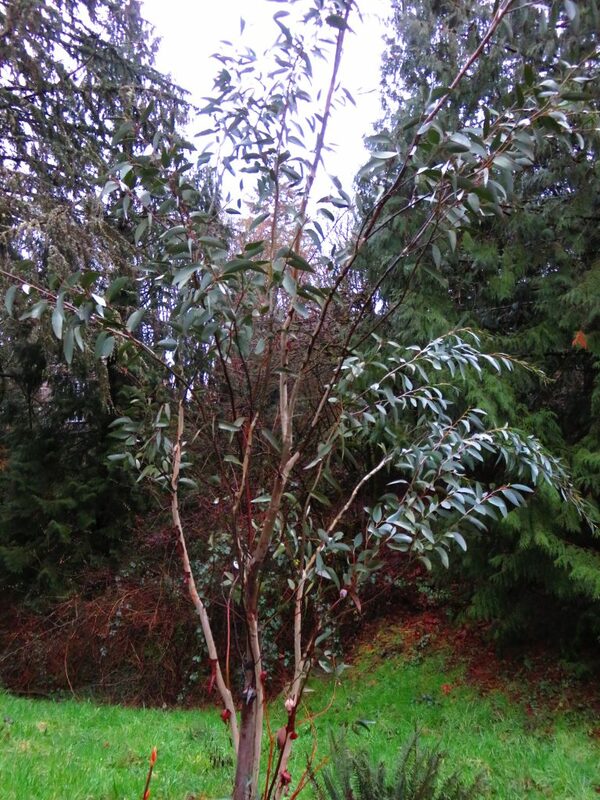 Eucalyptus pauciflora has a smooth and mottled bark that can be white-to-light gray or sometimes brown-red. 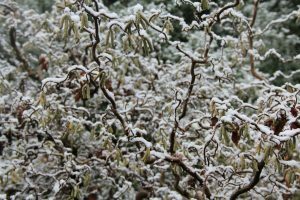 Instead of losing its leaves in the winter, this tree adapts to the weight of snow by bending its outermost branches to extend downward so that snow falls from its leaves. Native to Australia. Jounama snow gum is universally recognized as the hardiest snow gum for the Pacific Northwest. 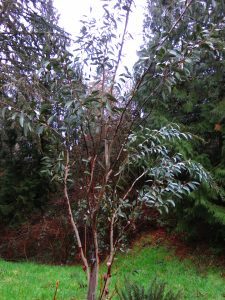 It has long blue-green lanceolate leaves that contrast with its light bark color, which makes this tree a year-round favorite. Find it in the Winter Garden.